WARP deforms selected polylines according to transformations defined by pre-designed shapes. These shapes represent the result of transforming a rectangle. This powerful tool gives users the power to create unique designs quickly, with just a few mouse clicks. Double left click to see the selection of shapes available, click on the desired Warp pattern, then draw a box around vectors that you want to warp. Repeated use of the same tool on the same image increases the amount of distortion to the original vectors. Warps can also be combined to create new effects. 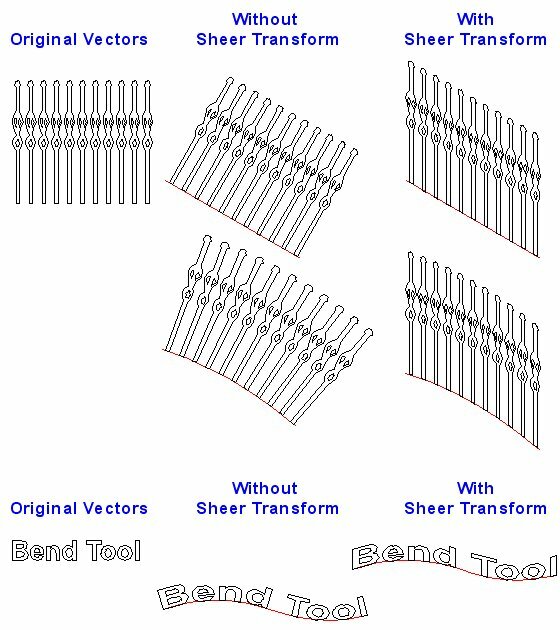 The BEND TOOL has a new feature, Sheer Transform. This feature doubles the flexibility of the Bend tool by forcing vectors that were originally vertical to remain vertical. Without Sheer Transform vectors angle along the path of the selected line or arc. The Bend Tool Dialog now has a picture that illustrates how the selected options will affect the bend tool results. Cutting Shop’s TWAIN interface (the software that allows Cutting Shop to call your scanner software) has been made more flexible. Some scanners have faulty TWAIN interfaces that make the scanner software difficult to call. Cutting Shop’s TWAIN interface can now be modified by the user if there is a problem getting the scanner to run inside of Cutting Shop. See the following dialogue box. SEARCH FOR DUPLICATES is a new Edit feature. It searches for all entities that are exact copies, and gives a message regarding the search results. Duplicates may be automatically deleted, or moved to another layer. The INFORMATION TOOL which gives information about the vector drawing, such as AREA and PATH LENGTH, now includes arc angles in both degrees and radians. The FREEHAND TOOL now obeys object snapping for the first and last points. ARC DEFORM TOOL updates Segment Length dialog in real time. SELECT CLOSE SEGMENTS is another new Edit feature; it finds all lines within user defined distances that are within the specifications. Lines found to be too close are shown as dashed red lines and can now be edited. ARC FILTER, also an Edit feature, displays all arcs that are either larger or smaller that the Maximum Radius and Minimum Radius. Arcs that are not within the users specified parameters are displayed as dashed red lines, and can now be edited. If the identified arc is very tiny a red node point may be the clue that there is a tiny arc. The RADIAL ARRAY TOOL has been improved. It is now easier to get exactly the array you want. The user now has the ability to choose a point which Array will use to rotate around. Click here for a description of new features for Cutting Shop Version 4.0.